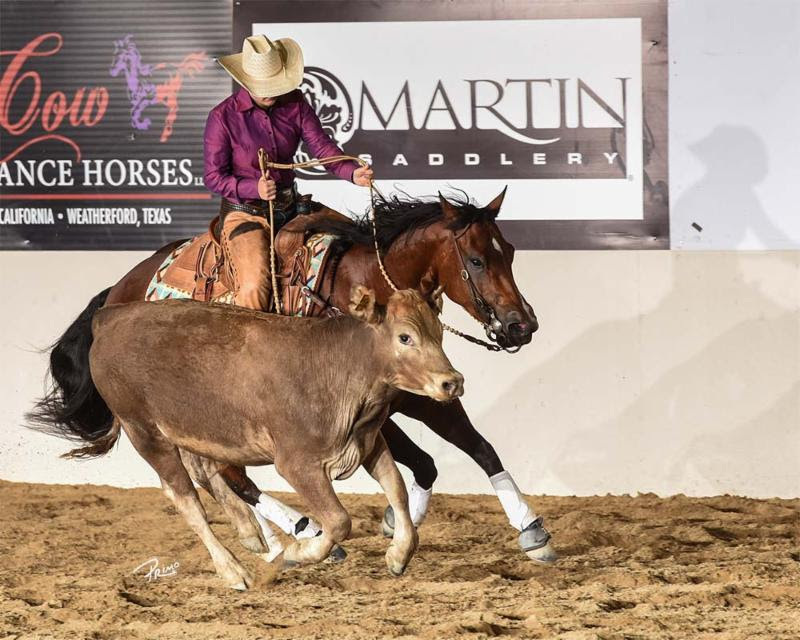 The first day of the National Reined Cow Horse Association Jack and Phoebe Cooke Memorial Derby is complete, as we crowned spectacular and horse show class champions at the Paso Robles Event Center in Paso Robles, California. Today, many of our horses and riders marked big scores throughout the cow horse triathlon of herd work, rein work and cow work. Meredith Graber and CSR Lay Down Sally (Dual Spark x Look At Her Glo x CD O Cody) came very close to a clean sweep in today’s Non Pro Bridle divisions. Meredith and her 2011 mare “Sally” topped the leader board in the Non Pro Bridle Spectacular, Intermediate Non Pro Bridle and Novice Non Pro Bridle. The pair scored a 142 in the herd work, a 141.5 in rein work and a 144.5 down the fence, leading to a payout of more than $6,000. Meredith Graber and CSR Lay Down Sally marked a 428 composite in the Non Pro Bridle Spectacular. Primo Morales photo. 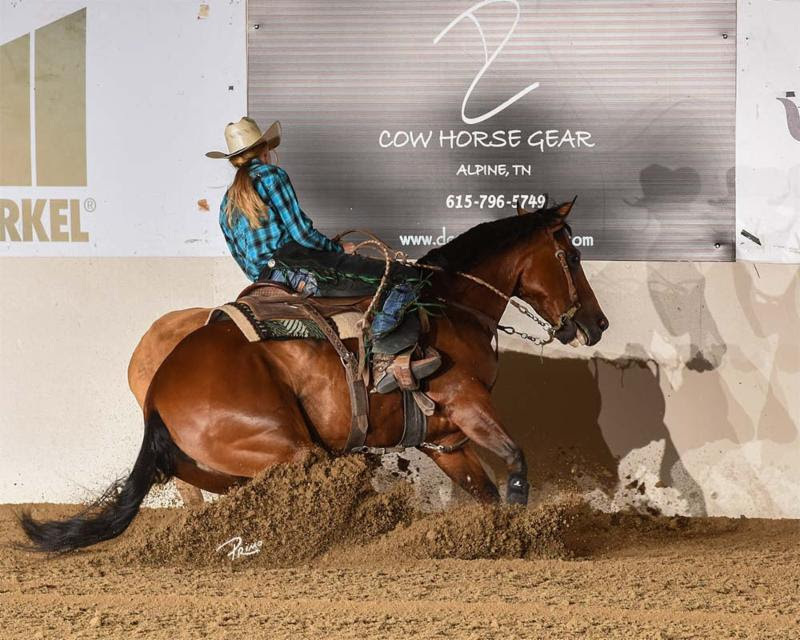 Canadian cowgirl Terri Holowath piloted SDP Blu Rey (TR Dual Rey x Sues Lil Dusty x Meradas Blue Sue) to the Non Pro Two Rein Spectacular and Non Pro Two Rein championships. This dynamic duo took control in the cow work scoring a big 149 down the fence. Terri co-owns the 2011 stallion with her husband, Bart. Terri Holowath and SDP Blu Rey took a nine point lead in the Non Pro Two Rein Spectacular with a composite of 434.5. Primo Morales photo. Our Youth Bridle Spectacular champion comes to us from Powell Butte, Oregon. Haydin Steffen and Nics Chica Lena (Tejons Lena Nic x Ms Bonanza Anna x Major Bonanza) made their second appearance in a Youth Bridle Spectaular, marking a composite of 421. Haydin Steffen and Nics Chica Lena earned a 143 down the fence. Primo Morales photo. Another team taking home two wins are Lauren Langbaum and Little Soldado (Sophisticated Catt x Miss N Suzana x Miss N Cash). Lauren and her 2012 gelding clinched the Youth Limited Spectacular and Youth Limited titles with a 142 in the herd work, a 141 in the rein work and a 144 in the cow work. 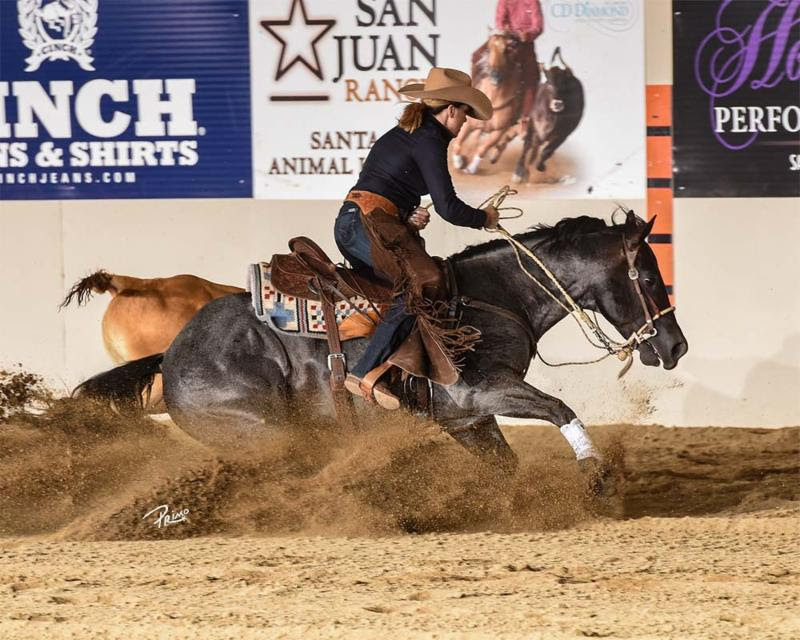 Lauren Laungbaum and Little Soldado, pictured at the 2018 NRCHA Derby. Primo Morales photo. 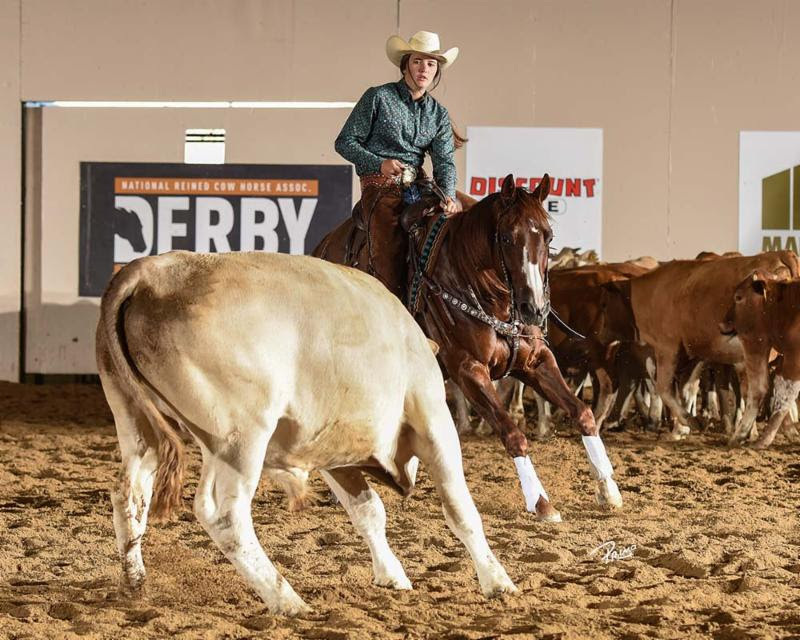 The NRCHA Derby is one of the largest and most prestigious events for 4- and 5- year-old reined cow horses. Shown two-handed in a snaffle bit or a hackamore, horses are judged in three preliminary events: rein work, herd work and cow work. Top scorers from the preliminaries will advance to on to the clean-slate finals on Saturday, June 16, for a chance to win the coveted title of 2018 NRCHA Derby Champion and a share of the more than $300,000 total payout.